Used as a way to punish women, the breast ripper was a painful and cruel way to mutilate a woman's breasts. This instrument was mostly reserved for women accused of conducting a miscarriage or those accused of adultery. The claws were used either hot or cold on the victim's exposed breasts. If the victim wasn't killed she would be scarred for life as her breasts were literally torn apart. 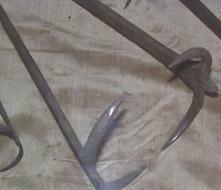 A common variant of the breast ripper is often referred to as "The Spider" which is a similar instrument attached to a wall. The victim's breasts were fixed to the claws and the woman was pulled by the turturer away from the wall; successfully removing them.